We Boomers are way ahead of the Millennials. We have known experiences trump possessions, as Millenials seem to have just discovered. Experiences are what we crave and we know experiences will bring life fulfillment. Since Grandpa and I went to India in 2005 and members of our group raved about an overnight stopover to Dubai and Abu Dhabi, flying Emirates Airlines, then the number one airline in the world, we were intrigued and wanted to experience what they experienced. It was not until this summer, twelve years later, that our travel plans were perfect for such a stopover, in conjunction with a trip to Africa. And a perfect experience it was. Perfect requires precision planning when it comes to one of the most expensive places to visit in the world. If you are going to Dubai, you do not scrimp. You figure out how to get the most for your travel dollar and fit as much as you can in as short a time as you can. American Express Platinum is essential to get the most for your travel dollar in Dubai, so start accumulating points. We were able to take advantage of the two for the price of one Emirates Airlines business class flights, which program has recently changed. Check out the changes. Emirates Airlines is now the number three airline in the world, although they still claim in advertisements that they are number one. Was the experience worth it? A resounding yes. Emirates is an experience. There are shower rooms available in the lounge, which has wonderful and luxurious amenities. The food is not of the quality we heard about, but ample and satisfactory. The food on the airplane was better than in the lounge. Having flat beds and mattress pads made for comfortable sleep on the airplane. The Emirates Dreamliner we are convinced left us without jet lag, but who knows if it was not just adrenalin for the amazing travel experience that awaited us. Remember that the United Arab Emirates has the tallest, largest, and newest of everything in the world. There is a tower being built somewhere else in the world that is supposed to be taller than the Burj Khalifa in Dubai, presently the tallest building in the world, so, already in the works is another tower being built in Dubai that will be taller than the still uncompleted tower elsewhere. Expect to find everything to exceed your expectations. The Burj Al Arab in Dubai is the number one hotel in the world, and the only hotel in the world listed as seven star. Take a look at the pictures on line; it is on every ad for Dubai as it looks like a giant sail on its own island. It is more over the top in person, changing every hour of the day and night. Grandpa and I have stayed in six star hotels, and this was better. We agree that it is the number one hotel in the world. Yes, you should stay here, and here is how to rationalize its one night cost, by considering it two full days of outrageous lodging and luxurious amenities and gifts. Using American Express Platinum reservations, you get early check-in (12 noon), late check-out (4 pm the next day), including an extensive buffet breakfast overlooking the pool and ocean, including two 50 minute outstanding massages in the over the top Talise Spa (couples room experience with foot bath), your own private butler (who will give you a tour of all of the intricacies of this also over the top hotel and actually walk you to your reservations), and a two story duplex suite that is likely as big or bigger than your home. Not to forget the gifts for your stay: desserts to your room (if you are celebrating an occasion, expect roses and the best chocolate cake in the world), two Burj Al Arab totes, two sets of Burj Al Arab flipflops, men’s and women’s Hermes products including cologne, soaps, lotions and extras when you leave. We deducted the prices for all the amenities and gifts against the price of one night of the room, and rationalized that we truly got value for the astronomical price of the Burj Al Arab. If you have American Express points, you can use them to lower the room price. The best advice we got was from the American Express Travel consultant, who told us to maximize our time in the United Arab Emirates by going on a tour of Dubai as soon as our plane arrives in the morning with drop off at the hotel, stay at the hotel for the American Express extra time allotted and not leave, and then, at check-out, go on a tour of Abu Dhabi and be dropped off at the airport. Dubai is modern and vibrant, with mostly foreigners, and only 15% Emiratis. Abu Dhabi is much more Emirati conservative, where a woman must cover up. We ended up with nearly 24 perfect hours at the hotel and two perfect tours. We did not use the company she recommended, Arabian Adventures, because we were in Dubai in the summer. Arabian Adventures is known for outdoor activities, such as an ATV drive in the desert on the dunes. With 108 degree weather and scorpions in the desert in the summer, we chose city tours over outdoor adventures. Do not let the summer season deter you. It is hot but you are mostly inside an air conditioned car or inside air conditioned buildings. If you go in their winter, remember there are some outdoor adventures you could add or substitute day or evening (dinner at the dunes, for example). Using Tripadvisor, we found Dubai Private Tours, which was outstanding for the two tours including the Best of Dubai and the Best of Abu Dhabi. Their website is a short cut to descriptions of everything you might ever want to see. We combined what we researched was the best of Dubai from their standard Old Dubai and New Dubai tours into one that worked for us. We wanted to go to the top of the Burj Khalifa, and they told us when to buy the tickets on line (2 weeks out). Our American Express consultant said we should not miss Abu Dhabi, with the largest mosque in the world and the Emirates Palace Hotel tea. We were told to be at the Abu Dhabi Mosque at sunset, as it is most beautiful at sunset and at night, and we agree that this was the way to go. We did stop for the Twenty Four Karat Gold Tea at the Emirates Palace Hotel in Abu Dhabi, an all you can eat ridiculous calorie laden experience you do not want to miss. Having now been to both Dubai and Abu Dhabi, we can now refine further. 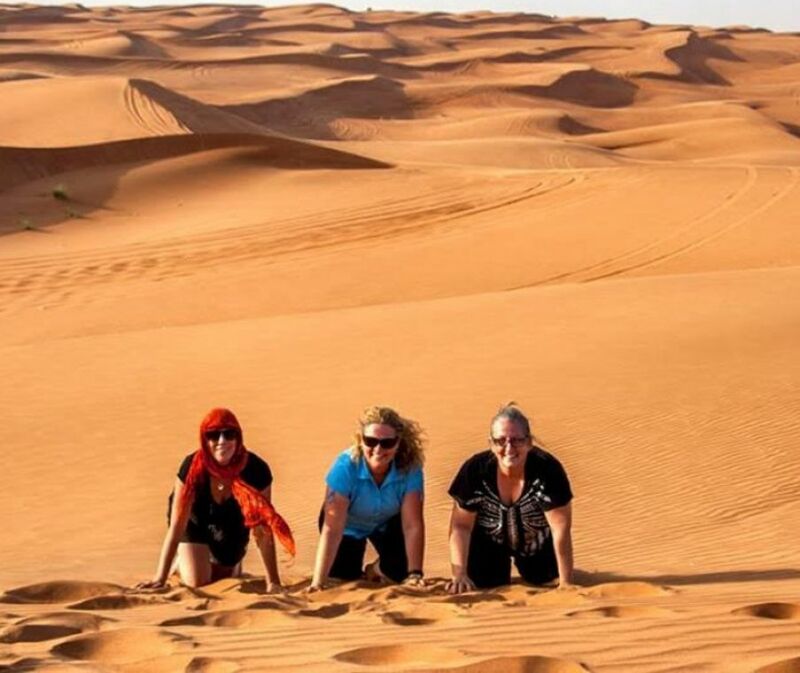 Not only was the Dubai Private Tours booking experience excellent and easy, Excelle Flores’ was most helpful in refining our preferred and personalized itinerary, and our guide and driver were superb for both the Dubai and Abu Dhabi tours. Marikkar was our tour guide, and she was knowledgeable, friendly and outstanding. Pick up at the airport was seamless, and we were well on our way. She had everything timed perfectly, and knew exactly how long it would take from place to place, maximizing our time and tour. Marikkar explained culture, customs, tradition, citizens, government, architecture, and seemed to know the exact locations of every store and restaurant in the largest mall in the world with seven miles of stores. Definitely ask for her. Our driver, Santeesh, was the perfect compliment to Marikkar. Each explained how his or her culture lived in the United Arab Emirates in conjunction with the Emirati citizens. Everything we asked about, one or the other knew the answer. This is the team you want for your perfect touring of Dubai and Abu Dhabi. We did not have time to go to Garde Robe on Jumeirah Road, and you want to ask Marikkar to take you there. Everywhere the Emirati women wore designer handbags. Garde Robe is where they sell their bags, in perfect condition, so that tourists can buy them at a fraction of the prices charged in the Dubai Mall. 8:00-9:00 am: Start Dubai Private Tours. See Old Dubai. Quickly walk through Gold Souk to Spice Market, stop in a spice shop and learn about camel chocolate as well as spices. Ride on Abra (wooden boat) on Dubai Creek and learn about how Dubai Creek is changing. Stop at Jumeriah Mosque. 12:00 noon: See New Dubai. See highlights of the Mall of the Americas (indoor ski area) and Dubai Mall, the world’s largest shopping mall (picture and video stop at Dubai Aquarium – the world’s largest fish tank in the world, fountains, eat an American lunch at one of the fast food places—if the stopover is on your way home, trust me, you will be craving this and you do not want to lose one extra minute at the Burj Al Arab). This does not include shopping time but all the stores are what you can find in the United States and the prices are higher, it seems. Drive through Palm Island, picture stop at Zabeel Palace. Skip everything else on suggested tours because. . . . Between 1:00 and 2:00 pm: Burj Al Arab! Check-in is in your room, so immediately begin living like a sheik. Exploring the views, all the cool tech things in your two story duplex suite and all the amenities of the rooms, plural, will consume your time quickly. Did I mention the huge mirror over your bed, which your butler will offer to cover, if you want to live like an Emirati? 7:00-7:30 pm: Sunset and Dinner at Burj Al Arab. Check on line when sunset occurs as it is an experience at the pool and sea view area of Burj Al Arab. Look up at the amazing colors of the hotel at night. If you want a dress code and add again half the cost of your room, eat seafood at Nathan Outlaw Almahar. We ate at Scape Restaurant, at an inside table with poolside and sea view. The casual seafood and meat restaurant had outstanding service and delicious options. In the winter, we would definitely eat outside. Walking around the extensive pool area is best done at night in the summer, although there were many enjoying the various pools and deck amenities in the evening. After dinner: Uber to the Dubai Mall. Ask the driver to take you as close to the dancing fountains as possible. Be there on the hour, as the show is every hour 6 to 11 pm on the hour, to watch the fabulous five minute show. There is a special Uber mall stop location to get an Uber back to the Burj Al Arab. Timed correctly, you will be gone from the amazing Burj Al Arab less than one hour. Is it worth it? Absolutely, yes. YouTube does not do it justice. If you must shop, the mall is open late, but honestly, people watching is more interesting than the shopping and you can do that at the fountains. Be sure to have Marikkar explain the different burkas and level of coverings depending on where in the Arab nations a woman is from. AM: Enjoy all of the amenities of your room and the views, the enormous breakfast buffet, and the butler tour of all of the Burj Al Arab, end at the Spa around 11:30 am to enjoy the amenities of the spa. 12:00 noon: Couples’ room at the over the top Talise Spa for your couples massage. Note: male masseuse for men only so there will be a male and female masseuse in the couples’ room. 3:00-4:00 pm: Reluctantly leave the Burj Al Arab after being given gifts upon leaving. Begin 1 ½ hour drive to Abu Dhabi. Learn about the magnet tunnel being built where it will take 12 minutes to go from Dubai to Abu Dhabi. On the way, stop at Yas Island- Formula one track and picture stop at the world first and biggest indoor Ferrari theme park. Highlights of Abu Dhabi include a drive through Abu Dhabi Corniche, seeing the skyline of Abu Dhabi, and learning the differences between the buildings and government of Dubai and Abu Dhabi, two of the seven Emirates that make up the United Arab Emirates. 5:00-5:30 pm: High tea reservations at the Emirates Palace Hotel, eating an unlimited amount of high caloric 24 karat gold encrusted food and enjoying your signature 24 karat gold encrusted cappuccino. 6:00-6:30 pm: Drive through the Al Bateen Presidential Palace. Drive to Sheikh Zayed Grand Mosque ( Have to wear long sleeve dress to visit Mosque. No Shorts. Females to cover head with Scarf. See website to get the dress code. Sunset: Tour of the Sheikh Zayed Grand Mosque, largest Mosque in the world, holds 40,000 people. Plan on 1-1 ½ hours. The Mosque is a must see spiritual and magnificent place. People watch and take more videos and pictures, especially after dark. To Airport: After the Mosque tour, 1 ½ hours back to the Emirates international terminal at Dubai airport. Do not bother with a helicopter ride in Dubai as there is haze over the city most of the year. There are many tips on line, but there are some etiquette tips you should remember. Do not snap pictures of the people. Do not use your left hand (considered ‘body hygiene’ hand). Dress modestly covering your shoulders and legs. At the Abu Dhabi mosque, you need to be covered completely and wear a hijab. Buy the Khatib Jersey Cotton Hijab Easy Instant Headscarf Wrap on Amazon. The key to the perfect 36 hour stopover experience in Dubai and Abu Dhabi is to live and enjoy like a sheik for a once in a lifetime splurge. Why not when you have the only seven star hotel in the world?